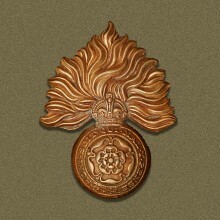 Royal Fusiliers WW1 cap badge. 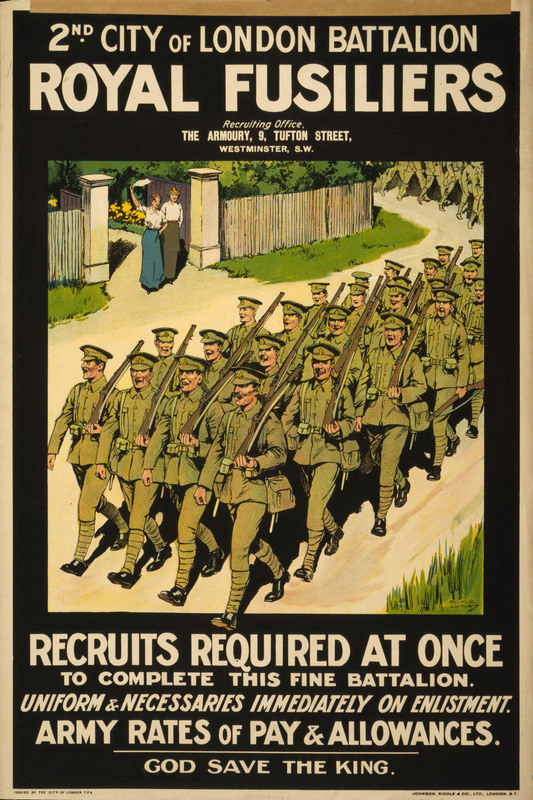 A Royal Fusiliers (City of London Regiment) recruiting poster from WW1. Frederick Cecil Rawdin is remembered on the Methodist Roll of Honour in Bottesford. He is also listed as an Absentee Voter in 1919, his home at The Green, Bottesford, although, unusually, no military service information is given. Fred Cecil Rawdin was born in 1890, son of Thomas Rawdin, born 1848 in Bottesford, and Sarah Rawdin, born 1851 also in Bottesford. In 1891, Thomas was a canal labourer and the family were living on The Green, Bottesford. The children at home were Sarah (13), Frank (11), Harry (5), Rose (3) and Frederick (1). He was thus the youngest son, following his brother Harry, who also served in WW1. Frederick Cecil was at school in 1901. In 1911 he lived at 15 Cromwell Road, Melton Mowbray, and was working as a domestic gardener, aged 21. Cecil Rawdin enlisted in 1914 and served in France before transfer to Gallipoli. His regiment then returned to France. He was taken prisoner: the Grantham Journal of 27th April, 1918, reported that, having been posted missing, he was known to be a POW in Germany. Then in January, 1919, the Journal was able to report the news that Frederick Rawdin had returned home to Mr T Rawdin [his father] looking fit and well after being in captivity in Germany since the end of the previous March. The WW1 Service Medals and Awards Rolls, 1914-1920, record the decoration with the 14-15 Star Decoration in 1919, to 2008 CPL Rawdin F, 30/11/1915, 2nd Btn Royal Fusiliers. A second entry additionally records his decoration with the Victory Medal and British War Medal, 1920, to G.S/2008 Sergeant Rawdin, Frederick Cecil, with the addition of his postings: 2nd R.Fus., Sergeant, 18/9/1915-3/1/1916; 32nd R.Fus., 25/8/1916-16/3/1918; 23rd R.Fus., 17/3/1918-19/1/1919. There is a period during 1916 that is not accounted for. 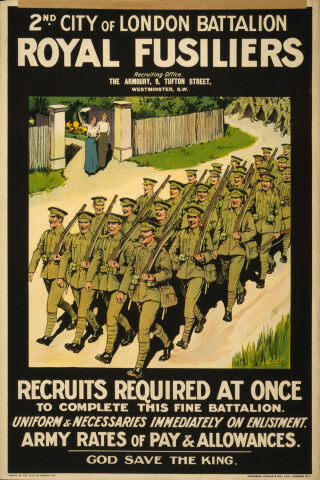 The third posting, to the 23rd Battalion, coincided with his imprisonment, and was presumably a notional posting made for administration and pension purposes. As the Rolls make clear, he was awarded the 1914-1915 Star, Victory Medal, and the British War Medal. Cecil Rawdin married Sarah Bond in 1927, at Basford, Nottingham. Neither were located in a search of Electoral Rolls failed to locate either Cecil or Sarah between 1927 and 1931 (the limit of the search). It may be that he went back into the forces after his discharge in 1919, and the couple lived overseas, but there is no evidence to support this guess. The General Register records that Cecil Rawdin died at Nottingham in 1957, aged 68. Became a POW in March 1918, returning home in January 1919.